With all the insider places I write about, there are still many obvious popular Paris places I’ve never been (don’t be shocked): Invalides, St. Chapelle, Fontainebleau and L’entrecote. L’entrecote has been on my list for years, and after many failed attempts to get in without waiting on line for 2 hours because of the no reservation policy, the other night I lucked out. A friend of mine called at the last minute to have dinner and I suggested L’entrecote, still being naïve enough there would be no line. I arrived 30 minutes later, and miracle of miracles, we were seated immediately. We chose the St. Germain de Pres location, (there’s a second one in the 8th arr. near the Champs Elysee) with a typical, pleasant bistro atmosphere of French posters and dark red leather banquettes. There’s only one dish on the menu: steak frites with a simple green salad. I suppose you’re wondering what’s the big deal, since one can get steak frites at any corner bistro. True, but what makes L’entrecote special is the secret sauce that tops the steak. A tangy mustardy, béarnaise-like mysterious sauce, it was scrumptious and gave the steak a whole other taste dimension. Served already sliced, the meat was tender and juicy, and the frites, were the perfect temperature and crispness. One drawback was delightfully corrected immediately: the portion seemed small but I was told you could have as may refills as you like. This was music my glutton’s ear, and I, of course, had seconds. The prices were right: 22 euros for my plat, 16 euros for a bottle of the house red wine, and 4.20 euros for 1 liter of Vittel water. Stuffed and satisfied, we walked out spending 30 euros a person. Beware: Much like Rays pizza in New York, there are many imposters saying they are the “original” entrecote. Don’t believe them: stick to the one and only locations listed below. Important Note to Subscribers: Due to circumstances beyond my control, sometimes there will be two postings in one email, so please always scroll down to the bottom of the posting to check if there is more than one story. 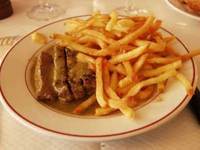 I just had to write and tell you that L’entrecote is also one of MY favorite restaurants in Paris ( I usually go to the one in the 8th) and it is on my restaurant list, which we send all of our clients before they leave. As a matter of fact, the Jackson's went there on my suggestion and loved it as well. Darn Richard, now I am craving Steak Frites! Note to blog readers not familiar with Richard's tours: I am a travel agent who found Richard quite by accident and I have been arranging tours with him for my clients ever since. Not one of these visitors has come home without commenting on Richard's fantastic tours and delightful personality! Do yourself a favor the next time you are in Paris and schedule a tour with him. I know I will the next time I am there!